Are you planning on completing an internship? Do you want the 5 minute skinny on your favorite employers? Tired of long, boring presentations in a formal, stuffy environment? 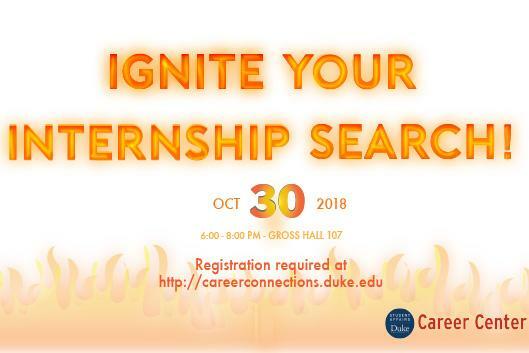 Then don't miss this year's "IGNITE Your Internship Search!" program! Plan to join us for this unique, high-energy event where you will discover internships with leading-edge employers in fields including technology, public affairs, social enterprise, consulting, research, start-ups, marketing, and more. In addition you will hear recruiters' and Duke alums' top advice on conducting a successful search across all industries. Afterwards, please join us for a casual meet-and-greet with the participating employers over light refreshments. Employers at this event will include Accenture, Procter & Gamble, SAS, Lenovo, Capital One, NetApp, Barings Wealth Management, the Nature Conservancy, BAERING Group, Fast Enterprises, and the Capitala Group. Additional employers are being added daily so be sure to check CareerConnections often.